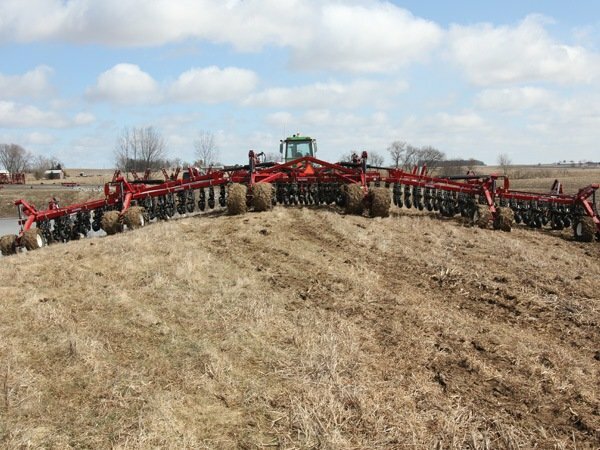 The Salford 525 Precision Disc Air Drill start with 2 sets of twin toolbars for maximum residue flow and a multitude of row spacing and fertilizer application options. The 500 series double disc openers adjust from 90lb to 500lb down pressure and the closing wheel helps to maintain accurate depth control between 0"-3". The row units can be fitted for split-row or side banding fertilizer. Or the optional coil-tech coulters can be added for no-till residue management, and/or fertilizer application. The 500 disc openers maintenance free design, and tool less adjustments keep you in the field, instead of in the shop. With walking tandems on the mainframe and caster wheels across the machine the 525 frame is designed for contouring, as well as in field maneuverability. The impressive wing flex and mainframe weight equalization also help the 525 maintain accurate seeding depth across the entire machine.